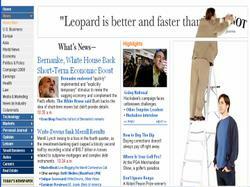 Go go go right this second to WSJ online to see one of the best online ads of 2008. PC is correcting headlines on the Wall Street Journal's home page and enlisting MAC to help him. "Come on MAC we have the whole internet to correct. Come on grab the ladder?" Who says that the PC and the MAC can't play nicely together? I'm not a MAC user but I could be :-) This is not social media .. but if this post is any indication the campaign could have a nice viral swirl with conversations on blogs. I loved that ad! I was just looking for it on YouTube this morning! So funny I stopped everything to show it to my wife. When was the last time you did that with a banner?